Hello, and welcome to the fourth installation of a column I’ve been ignoring on this site. The music download round-up is a series of posts chronicling area bands and artists offering direct music downloads either for free or for a small fee (no more than $5). Releases included will typically be those that have been available for more than a few months, or albums from artists that are buzz-worthy but aren’t yet ready for their own dedicated post. This post, like the last, has no real recurring theme, but I recommend checking out every one of them. 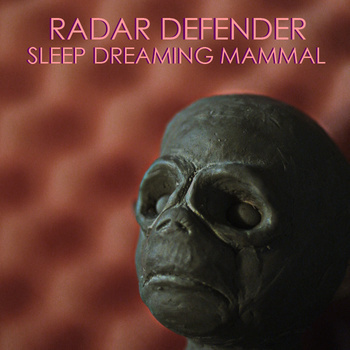 Radar Defender – Sleep Dreaming Mammal (2010) – This EP took me completely by surprise the first time I listened to it, and it still gets frequent play to this day. The seven songs therein are filled with groove-heavy bass lines and poppy guitar hooks laid against a keyboard backdrop, and contain much of the same time capsule quality as many of the greatest hits from The Rentals, The Amps, and The Breeders. The EP just had its second birthday recently, so for the love of local music I really hope we can all expect something new on the way from Scott Burr, Tyler Snell, and company. Follow the link for a pay what you want download. 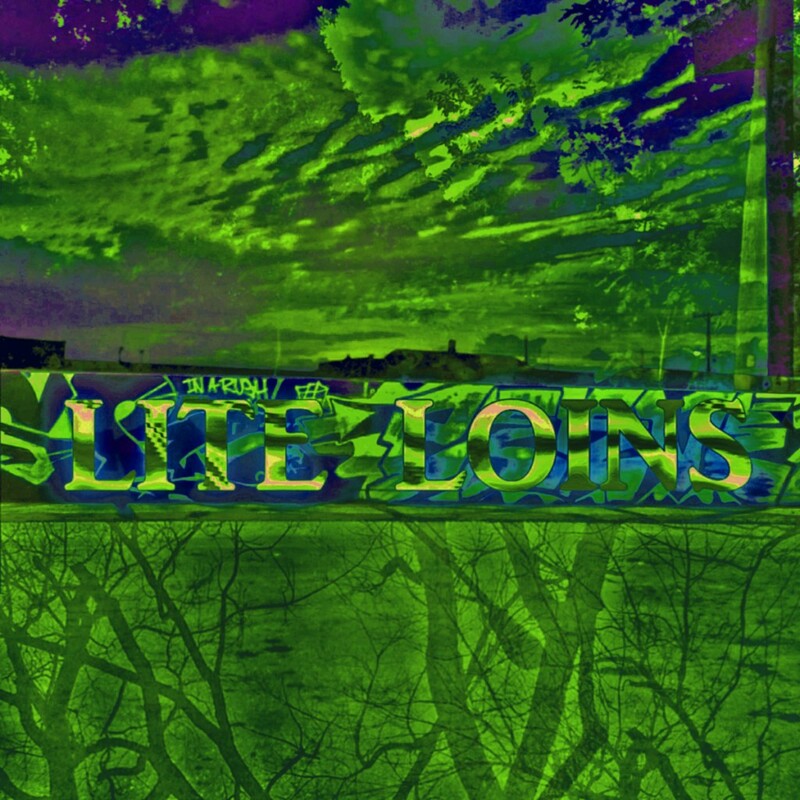 Lite Loins – Country House (2012) – If Radar Defender is Scott Burr and Tyler Snell’s commemoration to the laid-back tunes of a mid ’90s Kim Deal, then Lite Loins would be Thadd Lewis, Dane Carlson and Cal Santos’ exaltation of Steve Albini’s work in Shellac from the same era. The mix is purposely filthy and at times warps like a water-logged cassette, but the six tracks could just have easily been pulled from the long-neglected shelves of Sub Pop or Touch & Go when their output was still respectable. This EP can be found along with another one for free at the link to the band’s homepage. Both were mixed and released posthumously. Grizzly J Berry – Tour Demo 4.20 (2011) – I have mixed feelings about this one. The songs are well recorded, and display some pretty decent technical guitar work akin to something in the Kinsella bloodline (American Football, Cap’n Jazz, many others). At the same time, the sound present on this recording has been a little played out now that it’s been successfully muddled down by bands like Maps & Atlases. The EP thankfully stays away from the beating of a dead horse and keeps things from getting too predictable by adding in a Mars Volta-style prog element. Free download from this defunct band at the link. 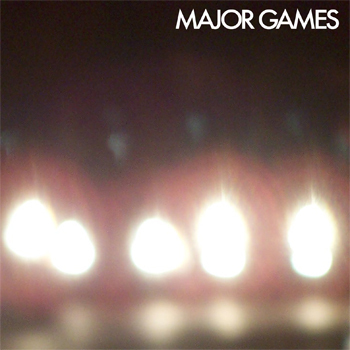 Major Games – EP1 (2011) – On the topic of weirdo prog, I present to you one of my favorite debuts from last year. I’d be remiss if I posted this EP without mentioning the great Lawrence acts from which these men came. Bassist Jeremy Sidener played in early ’90s band Zoom, guitarist Doug McKinney played in the equally revered Panel Donor (which was later joined by Sidener on guitar), and drummer Steve Squire played guitar in Everest with McKinney. The EP is textured with a reasonable measure of pedal work, and at times ventures into pure noise before coming back to a structured sound. Get it for $2.50 at the link. Worth every cent. Power and Light – EP (2012) – It’s no secret that I adore the works of Andrew Connor. If you’ve read this blog before, you may have seen me refer to his songwriting style as a “Midas touch,” and I still stand by that statement. Between working with Ghosty (who are on the eve of releasing a new album) or playing with The ACB’s, Connor found time to collaborate with local producer Nathan Readey, and the end result is three tracks of woozy, synth-filled Euro pop that instantly became a city-wide sensation. I’m not here to tell you what’s hip and underground, my only purpose is to show you what is good. Free download at the link. Kansas City’s Actors&Actresses has a sound that far surpasses what one would expect from just three people. The trio have steadily built a national fan base thanks to their label The Mylene Sheath (Gifts From Enola, Junius, Giants) with which they have worked for most of their existence. 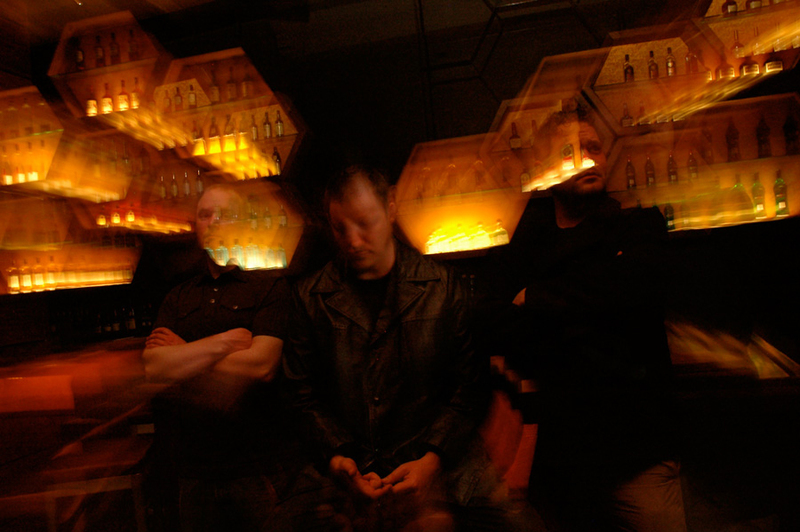 The label released the band’s latest studio output, 2009’s Arrows (recorded at Eudora’s Black Lodge with David Gaume of The Stella Link), though they most recently re-issued the band’s 2005 debut EP, We Love Our Enemy (recorded at HUM frontman Matt Talbot’s studio with the great Paul Malinowski of Shiner). With the recording details listed above, I think one can surmise that the band is largely influenced by a sonically driven, spaced out rock that has been championed by the likes of Failure, HUM, and Shiner, among others. While those who are looking forward to brand new A&A tracks will have to wait a bit longer, their take on HUM’s “Aphids” can be found on the recently released tribute compilation to the aforementioned, Songs of Farewell and Departure. 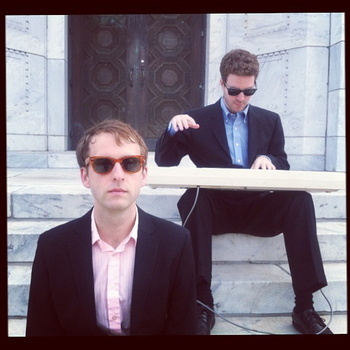 Locals Anakin and The Esoteric are featured on the album as well, performing “I’d Like Your Hair Long” and “Iron Clad Lou,” respectively. Author side note, I’m confused as to why no band attempted a re-imagining of “Diffuse,” a top 3 favorite of mine from the band. But perhaps this is for the best, lest it be tainted by a group who should not even be included in the first place (ahem, Funeral For a Friend). 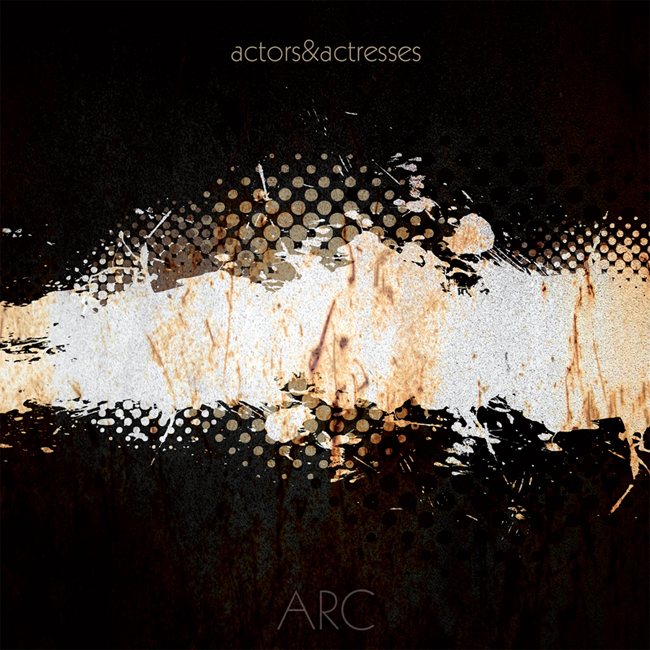 On Friday, September 23rd, The Mylene Sheath will begin accepting pre-orders for ARC: Arrows Remix Compilation, a 14-track (digital) or 8-track (vinyl) remix and reinterpretation album, featuring various artists de- and re-constructing songs from the band’s 2009 album. A few of the artists featured include Philip Jamieson of Caspian (under the guise The Atlas Ladder), Will Benoit of Constants (using the name New Rochelle Rotary Club), Arms & Sleepers, and other artists who may have crossed paths with the label in the past. Only 207 copies of this release will be available on vinyl, and only part of that will be available for pre-order from the label. If you want to get in on this, either get your mouse finger ready or track down one of the members of the band. Additional nerd note: in 1993, HUM’s “Diffuse” appeared on a compilation CD released by Lawrence label Lotus Pool, titled Feast of the Sybarites. The compilation was populated primarily by Midwestern bands, including local artists Howard Iceberg and the Titanics, Sufferbus, Kill Creek, Rise, Panel Donor and Zoom. The last two bands on that list had releases through the label around that time as well. The compilation is worth seeking out for fans of local music. 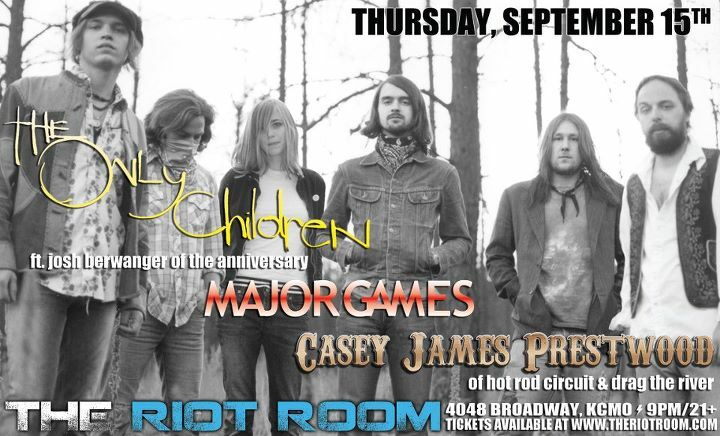 September 15th will mark the unexpected return of Lawrence’s The Only Children to Kansas City’s Riot Room. The group quietly went on hiatus shortly after the release of their sophomore release, 2007’s Keeper of Youth, and even frontman and Anniversary co-creator Josh Berwanger has kept mostly low-key in that time, unassumingly working in his career as a high school basketball coach. The band has plans to head in to the studio soon to record their third full-length, likely with another revolving cast of musicians. Opening for the band will be Casey Prestwood & the Burning Angels, the eponymous leader of which once played drums for Hot Rod Circuit and contributes to The Only Children. Also playing is Major Games, a trio best described as a grown-up mix of Lawrence’s Zoom and Panel Donor, and while it would be a stretch to lump the band in with the resurgence of twinkly riffed or reverb heavy shoegaze present in a variety of sounds these days, the members play a spaced out and prog-heavy sound of rock just begging for a conceptual full-length. On the inverse, and decidedly not staying low-key is Anniversary co-creator Justin Roelofs, a man who has seemingly gone from being a mere mortal human to some kind of sentient, dimension-traversing being traveling the known realms of time and space. At least that is what the man would have you believe. Roelofs’ White Flight project is mid-way through a Kickstarter project for his new album, Pyramid of Light. I know not if he truly has the audacity to believe his project can get the over $12,000 in pledges required to succeed, or he created the entire project as a scheme to get people talking about his upcoming album. If he chose the latter, then he is without a doubt succeeding. The project still has nearly a month left, but one who pledges can expect to get things such as “a 40 min. 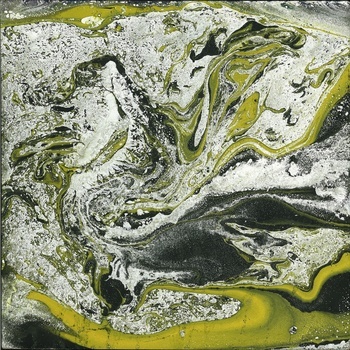 long sonic collage MIXTAPE made by White Flight in 2011, via mp3 download” for the lowest tier, or an “Amazing Crystal Quartz Necklace made by my partner Daughter of the Sun” for $111. Hell, for a meager $1,111, you can be so lucky as to receive “a CUSTOM larger scale sacred geometry painting, we can determine the image, color, etc. together via a phone conversation or skype session. Also I will share teaching on the I-Ching oracle in this conversation and teach you how to use it to make positive decisions in your life, if you aren’t already familiar with this system.” Sounds like quite a steal, that. Read the rest of the details from the project here. Earlier this year, local media outlets were beside themselves with the arrival of the new band Minden. The band, composed of members of Kelpie, the Button Band, Buffalo Saints, and other Lawrence acts from the last 5-8 years, was consistently being labeled as a supergroup. I really had no idea why they received this label, but the members have all been a part of musical projects I respect, so I took the term with a grain of salt. I’ve just learned of a new local band that encompasses the term “supergroup” in its truest form. Christopher Tolle has been active in the Lawrence and Kansas City music scenes for nearly 18 years, from his work in Rise, a high school band that is better off staying in the past (though the lineup also featured a young J.D. Warnock), and Action Man (a band that, if I can remember my history right, started as an offshoot of Five-0 called The Hayseeds, and even had John Harper in the lineup for the earliest days), to the locally seminal Creature Comforts and his primary project for the better part of the last decade, The Belles. Tolle has been a wellspring of great music output for half of his life, and is sure to continue this trend with his newest band, Early Reflections. Joining Tolle in his newest endeavor is Andrew Sallee of Namelessnumberheadman on guitar, vocals, and wurlitzer. Sallee and the rest of NNHM formed the band when they were living in Shawnee, OK, a small town about 45 minutes east of Oklahoma City, and though the band went through a few different names (Hipster Dufus, The Fauves) before settling on the one that stuck, they essentially found their name when they found a new home in Kansas City a little over a decade ago. NNHM have been dormant for the last few years, but popped up this past winter to play an anniversary show at Recordbar. Next up in Early Reflections is guitarist/vocalist Bill Latas, best known as one of the founding members of iconic Kansas City grunge/rock band Outhouse. Outhouse played a reunion show at Recordbar earlier this year, but Latas has been staying musically active in a funk/rock and occasional tribute group known as Perpetual Change. Coincidentally, Outhouse co-founders Brad Gaddy and Shawn Poores, as well as Go Kart‘s Larry Groce have been active in their new wave/’80s tribute band called The Zeros. Brian Everard is the resident bass player in the band. He is currently known as a member of both The Belles and Blackpool Lights, but was in The Creature Comforts as well, meaning all four of his most recognized bands have either been with Tolle, or a member of The Creature Comforts (drummer Billy Brimblecom is in BPL, as well as a range of tribute bands with CC guitarist Warnock). Rounding out the lineup and further proving the incestuous nature of local music, we have drummer and audio engineer extraordinaire Chris Cosgrove. The list of bands he has been in is dwarfed in comparison to the amount of artists he has worked with in the studio, but the most notable act he was in was the early ’90s math rock quartet Zoom, who themselves played a reunion (or four) earlier this year, one of which was at Recordbar (I see a growing trend here, no? ), as part of the previously mentioned NNHM anniversary gig. Early Reflections will be playing their first official show as a band on June 30th, opening for Meat Puppets at Recordbar. They have been playing unofficially as a more or less “Chris Tolle and Friends” band for a few months, though. One of their public performances worth mentioning is their participation in the recent Replacements tribute show, the lineup only a four piece of Tolle, Everard, Latas, and Shawn Poores. The Dead Girls, Chad Rex, John Velghe & His Prodigal Sons, and a cast of other area musicians appeared on the bill that night as well. 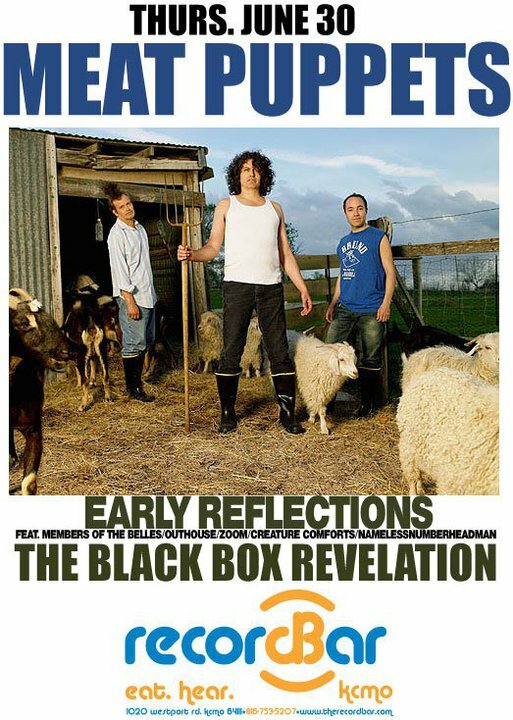 Appearing with Early Reflections and Meat Puppets is a Belgian garage revival band called The Black Box Revelation, for fans of Black Rebel Motorcycle Club. It will be a night that should not be missed.